Ahh To Be So Ignorant! Traveling often confronts you with your ignorance, in fact it's one of the best reasons to go anywhere. As Bill Bryson says, “I can't think of anything that excites a greater sense of childlike wonder than to be in a country where you are ignorant of almost everything. Suddenly you are five years old again. You can't read anything, you have only the most rudimentary sense of how things work, you can't even reliably cross a street without endangering your life. Your whole existence becomes a series of interesting guesses." Despite not speaking Portuguese I'm not having too much trouble with the everyday here in Lisbon but I am being confronted by the reality that there is so much I know nothing about, like the name and work of the preeminent Portuguese poets. However, when public spaces are inscribed with the names of the literary past it is harder to ignore the stature and place of foreign literary giants. The square at the end of our street the Praça do Camões is one of the major meeting points in Lisbon. I can personally attest to the number of noisy demonstrations that gather here on their way to, or from. the parliament building. We can hear them clearly from our flat. Last week there were several days of these loud 'manifestations' by fairground operators protesting against new levels of taxation. They gathered, sang and blew small horns for hours while offering a free bouncy castle for children which you can see them setting up on the left hand side of the square below! It all seemed strangely festive. So, the square has been both a noisy neighbor and a convenient meeting point, but it has also revealed my ignorance. 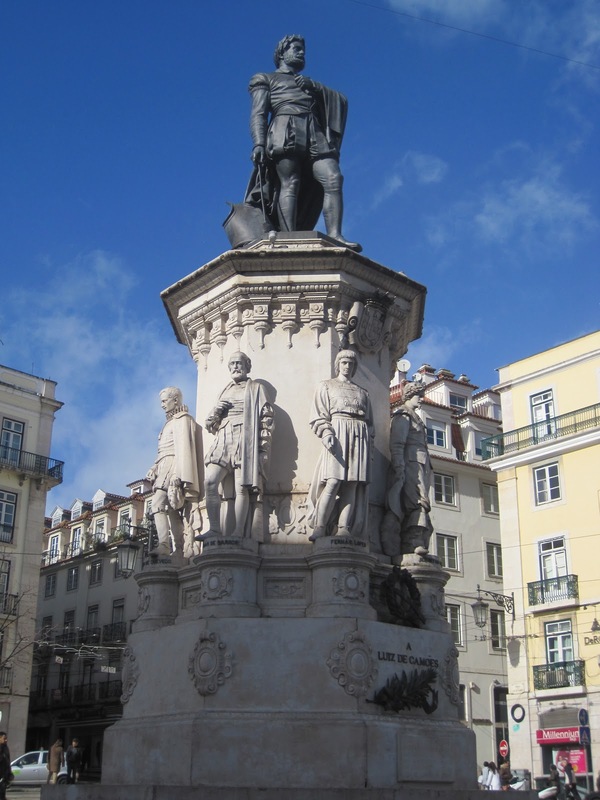 The eponymous Praça de Camões is named after the greatest poet in the Portuguese language, Luís Vaz de Camões, c. 1524-1580. 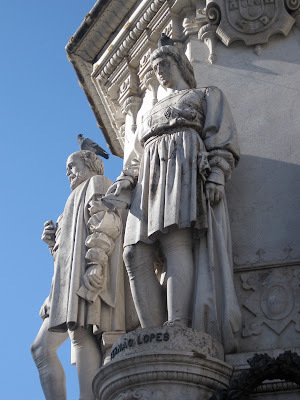 Compared in stature to Shakespeare here in Portugal, I should have realized his standing when I saw that he was buried next to Vasca de Gama in the Jeronimus Monastery in Belem. Known for Os Lusíadas (known as The Lusiads in English) his epic poem was inspired by de Gama's trip to the Indies. Clearly Camões' work is deeply entangled with the Portuguese sense of national identity. Project Guttenburg has a Nineteenth century translations available of The Lusiads online if you are interested in reading his work, otherwise here's a brief taste below. I picked this section for the mention of Lisboa! How vast the foe's, the Lusian fleet how few! 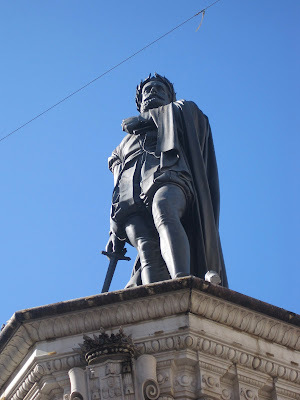 Ideally, travel would reveal and then cure us of our ignorance but perhaps more dangerously it replaces ignorance with a superficial understanding that may not outlive the holiday, but either way I'm glad that at least I recognize the name of Camões. Yes, the "blank slate" of the traveller arriving in a new country can be thrilling AND humbling. I wondered, who WAS that statue, Fernando Pessoa, seated in his chair outside the Cafe Brasileira and attracting scores of camera-wielding tourists??? Oh, one of Portugal's greatest writers.